Goichi “Suda51" Suda loves video games. Oh, sure, I love video games, and you probably do too. But when you play one of the games from Suda51 and his studio Grasshopper Manufacture, you can’t fail to come away with the impression that he lives and breathes this stuff—the passion for games, players, the culture around them just leaps off the page, as it were. His games, like 2005's Killer7 or 2011's Shadows of the Damned, are referential, self-referential, fourth-wall-breaking, and always find a way to bring the conversation back to Suda’s favorite topic, video games. Travis Strikes Again: No More Heroes, to be released January 18 for Switch, is all of this but cranked up to Ludicrous Speed. It’s a game about assassin Travis Touchdown playing a series of VR video games, and it takes every opportunity to comment on its own gamey nature. It’s all done in such a funny and clever way that it distracts from the fact that the gameplay itself isn’t as well done. Foul-mouthed otaku and murderer Travis Touchdown is an unlikely Nintendo character, but following his first two outings on the Wii in 2007 and 2010, his big comeback is a Switch exclusive (and the physical version is published by Nintendo, just to make the partnership a little more official). 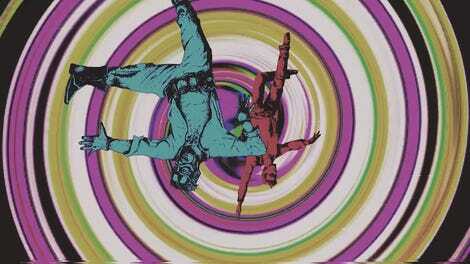 As the title suggests, it’s more of a spin-off and less No More Heroes 3. Rather than a series of fights against other assassins, it’s a more straightforward action game that’s usually played from a top-down, heavily zoomed-out perspective against waves of enemies. Viewed from that angle, the whole thing looks like it’s going to play out like a twin-stick shooter, but in fact you’re still primarily using Travis’ trusty, totally-not-a-lightsaber™ beam sword to battle. You have a light attack, which can be held down, causing Travis to rapidly swing the sword left and right. You can do this while running, and the game will occasionally raise up a whole crop of weak enemies so that you can enjoy the pleasure of mowing them down like so many blades of grass. This will rapidly drain your sword’s energy meter, which you’ll have to refill by clicking in the L stick and shaking the controller (or just flicking the R stick in handheld mode). As in previous games, Travis still holds the sword near his crotch and makes a masturbatory motion to charge the sword up, but since he’s usually zoomed out to the size of an ant it’s harder to see what he’s doing. You’ll primarily just use your heavy attack if you want to damage most enemies. But that’s far from the end of your options. You can also find and equip various battle chips that give you various special moves: Fire bolts of lightning, drop canisters of poisonous gas, force-choke an enemy and slam them to the wall, create a wall, create a healing zone on the ground, etc. These have cooldown periods, but they’re reasonably short ones, which allows you to use these moves multiple times in a battle. These battles are all self-contained: As you move through the game’s levels, artificial glitch-like barriers pop up, and you have to eradicate all of the “bugs” (enemies) in the “code” before you can proceed. The enemies all fall into a small grouping of archetypes—the one that doesn’t do much, the one that tries to get close to you and explode, the one with a shield that blocks normal attacks, etc. On the plus side, these enemies are designed so that even when the camera is zoomed out to heck and you’re playing on the Switch’s tablet screen, you can still tell which enemy is which. On the other hand, during those very rare times when the camera is zoomed in, you can tell that the enemies are very nicely designed, so it’s a shame that 99 percent of your interactions with them are as tiny little globs. 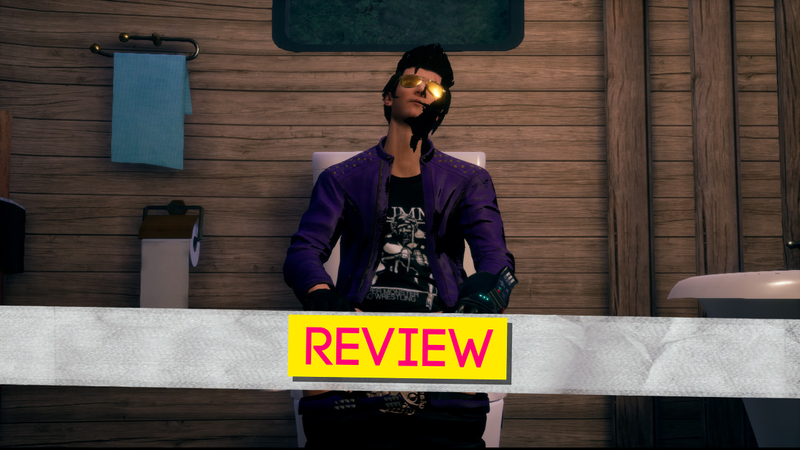 Each level in Travis Strikes Again takes the form of a different, fictional “virtual reality” game played by the protagonist from the comfort of his gross bachelor mobile home. The games that Travis plays are running on a fictional game system called the Death Drive Mark II. This is explicitly a Sega reference; the Genesis was called the “Mega Drive” in Japan and the Master System was called the “Sega Mark III” there. In case you miss this, when the system boots up, it shows its logo and a computerized chorus sings “Death Drive” in a manner not unlike the Sega jingle. It plays games on spherical media called Death Balls, and every time you get a new one, you also get a tearsheet from a fictional 1990s magazine showing a preview of the new game. My favorite one of these is a very specific joke that only old people like me will get: a preview of the console with an “artist’s rendering” of the final unit that is based on bad interpretations of real rumors, just like you’d see in Electronic Gaming Monthly back in the day. Once you clear each level, you have to go find the next Death Ball. These parts of the story take place in what is probably the most obscure, extended video game reference in the game—a visual novel-style Japanese adventure game, done up like an early 1980s computer program with green monochrome 1-bit color and 80s anime style portraits of the characters. There’s no choices to be made here—it’s just paging through dialogue, but it’s all written humorously, and I enjoyed these breaks from the action. I wish I could say I enjoyed the game’s primary levels as much, but I struggled to appreciate them. The “VR games,” which have names like “Life Is Destroy” and “Coffee and Doughnuts,” all begin in an intriguing way, with a clever intro sequence and a tantalizing title screen. But once you get into the action, these give way to straightforward, unappealing level designs. Beat a group of enemies and move on to the next screen, and… you’re back looking at the same assets in a slightly reconfigured form, fighting the same enemies again in a slightly different permutation. Every now and again, there’s a minigame that breaks up the action, but these are too few and too brief. The levels go on for twice as long as they need to, just repeating elements for no discernable reason except, perhaps, to turn a short game into a medium-length one. Creative concepts, funny script, solid swordfighting gameplay. Repetitive battles and level designs. Once through the main story, about 8 hours. I’m torn over Travis Strikes Again. I love the specific nostalgia in the story. I find it fascinating that Suda wanted to pay homage to all the creative indie games he loves by including their logos as collectible T-shirts, literally dozens of games including Papers, Please, The Messenger, Hatoful Boyfriend, and many more. I enjoy how Travis, an American otaku, badly mangles the pronunciation of “Itadakimasu” when he sits down for a bowl of ramen, or when he and his cat discuss how these lengthy text sequences are going to tank the game’s Metacritic score. In fact, all of these Suda51 hallmarks are what Travis Strikes Again really has going for it—it’s just the core of the gameplay itself is too thin to pin all this on.